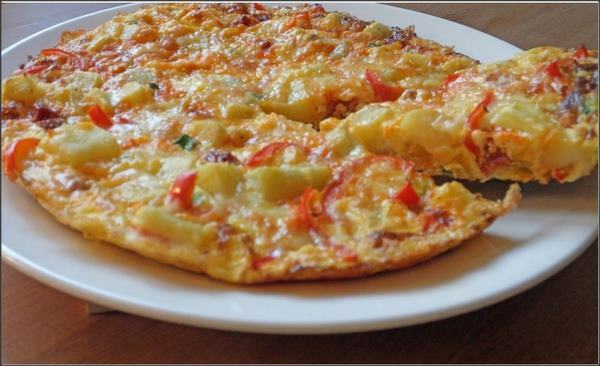 Spanish Potato Omelette is a delicious variation in breakfast. Combination of eggs along potato, onion, and cheese make it super tasty. Whisk eggs with milk and season with salt and pepper. Heat oil in a frying pan, pour half egg mixture that cover the base. Sprinkle potato, onion and green chili. Let cook for 1-2 minutes. Pour remaining egg mixture and cook 1 more minute and carefully flip over omelette. Cook the other side, when you are sure egg is fully cooked, sprinkle cheese and carefully transfer into plate.